In my recent post, I have shown how to gather the RPD and Webcatalog data required for data lineage. And now we will build an OBIEE rpd with these OBIEE Web Catalog and Repository CSV files by creating ODBC connections or we can import the CSV files data into a database table using any import tools. For example, I am using SQL developer to import data from CSV files into a database table. I used SQL developer excellent feature to import data from CSV files. This is very simple, just expand the database and right click on the tables. Then select Import Data. Select the CSV file to import. 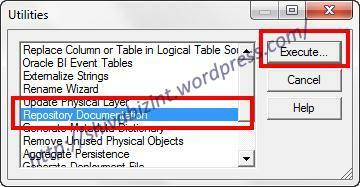 Define the CSV file properties, like format type = delimited and delimiter = tab. Proceed to next wizards. 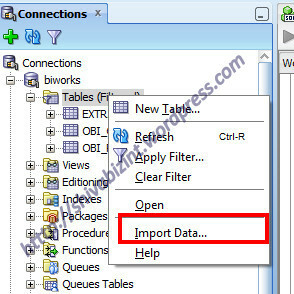 This will create a table in specified Oracle DB and imports the data into it. Repeat the same steps for RPD_Data.csv files to load into other table. Now import these tables into OBIEE RPD and build a repository with all 3 layers. Deploy this RPD and configure an empty webcatalog (or you can use existed one) through Oracle Fusion Middleware EM and restart all the OBIEE services. Now we are ready with the data lineage information. Just login to OBI Presentation Services and create the necessary reports to know about reports statistics and their columns definition all the way from physical sources. Question 1: What are the physical columns used by a report? Ok well, I’ll create a report with the required columns to answer this question (See the report below). From above report I can answer, what are the columns the report is made up with, what is the definition of a metric and what is the source of that particular column. And the above report also tells me what happens if I delete a particular column from RPD like what are the reports that are being impacted? Question 2: How many reports have been developed and who? Create a report and answer there are 39 total reports and ownership details are below. Like this we can create the reports to answer some crazy questions about column lineage. 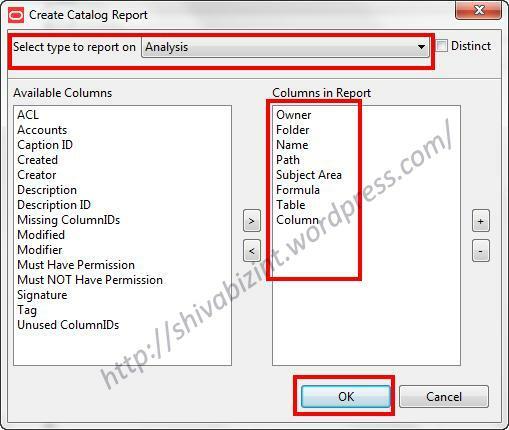 Hope this helps you all..
How the report columns are defined back in metadata? 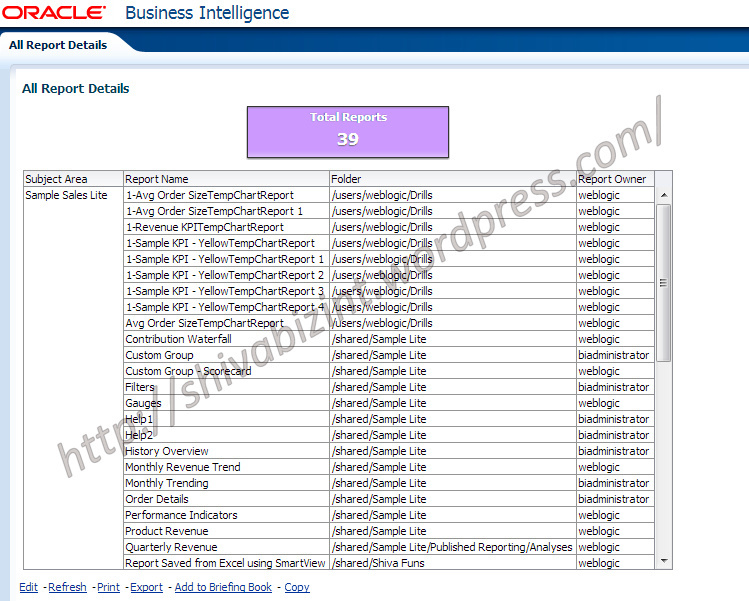 What are the OBIEE objects (Analysis, BIP Reports, Prompts and filters etc.) that are being referenced by a column(s)? How columns are mapped through metadata? Who are the owners of reports? And also if you want to modify/update your metadata definition, the developer/BI Analyst should be aware of the impact of that change in already developed content. To answer all these questions, we need to build a column lineage, from dashboard to subject area, to physical column, and then to column in source system. We have so many tools to build this Data lineage, but within OBIEE itself, we have some great information that can be used to build this Data Lineage to answer many of questions but not all. The All Web Catalog objects information can be found using Catalog Manager Report. 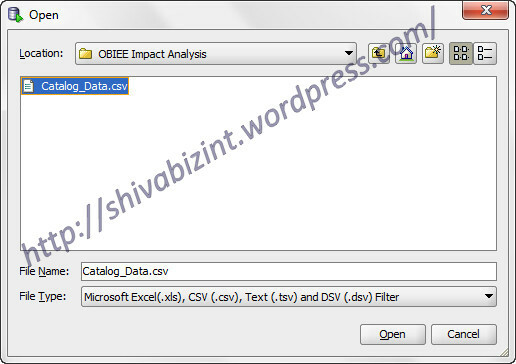 Generate a catalog report using Catalog manager and then export it to a tab delimited CSV file. Select Tools > Create Report. In the Create Catalog Report dialog, select the following columns to include in the report: Owner, Folder, Name, Subject Area, Formula, Table, and Column. Of course, this depends on what kind of analysis you are trying to do. Click OK, to generate the report. Save the report in a temporary file, for example c:\temp\catalog_data.csv. 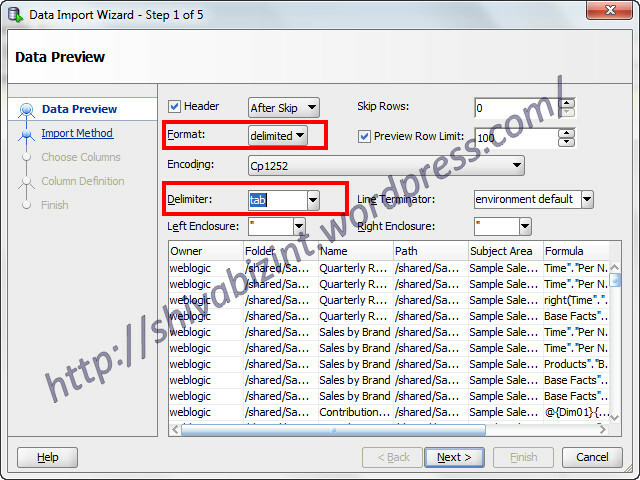 The file will be saved as tab delimited CSV file with all the information of the columns that we pulled. All repository objects information can be generated with Repository documentation utility available within OBIEE Administrator tool. Generate the repository documentation and export to a text file. In the OBIEE Administration tool, select Tools > Utilities. In the Utilities dialog, select the Repository Documentation utility and click Execute. Save the repository documentation in a temporary file, for example c:\temp\RPD_Data.csv. Lets see how to make use of this RPD and WebCatalog data to build column Lineage in my next blog post. A very helpful OBIEE Cache Purge/Seed utility – download it for free here!!! All the Opinions expressed here are entirely my own and do not reflect the position of my employer, Oracle or any other corporation. I'm NOT responsible for any damages in whatever form caused by the usage of the content of this blog.